This week marks the release of the ebook edition of my novel The Astronomer’s Crypt which tells the story of astronomers, ghosts, drug dealers, and a monster from the beginning of time colliding at an observatory during a ferocious thunderstorm. Here’s the cover and the back cover blurb. If you scare easily, don’t read this book. If you dare to read it, you’ve been warned. This horror novel, of course, was inspired by many nights working as an observing associate at Kitt Peak National Observatory. In fact, cover artist Laura Givens clearly used the Mayall 4-meter as her model for the telescope enclosure on the cover. This is fitting, since the building was the inspiration for the enclosure in the building. The Mayall 4-meter is a labyrinthine building filled with twisting corridors, dark stairways, and darkrooms abandoned when astronomical cameras went digital. People have taken wrong turns and gotten lost in the building. Bats sometimes congregate at the top of the dome. More than once, visiting astronomers have commented the 4-meter would make a great setting for a haunted house. Clearly the telescope on the cover isn’t in the Arizona desert. The novel is set on a fictional peak in the Sacramento Mountains of New Mexico. When I first went to work for Kitt Peak, one of its draws was the relative ease of access compared to almost every other observatory I’ve worked at. I wanted to drop the creepy building into a remote and isolated place where help wasn’t just a phone call away. The idea for this novel came to me during the World Science Fiction Convention in San Antonio which was held in 2013. My editor asked if I had any ideas for a creepy or suspenseful novel. I pitched the idea of a haunted house story set at a telescope and we tossed ideas back and forth over the course of the weekend. I left WorldCon that year with a nearly complete outline for a novel. Now, three years later, you can read the results. When you visit the retail sites, you’ll see this is Book 1 of the “Wilderness of the Dead” series. Yes, I have plans for at least two more books set in the Carson Peak Wilderness area of New Mexico. Lots of creepy stuff happens in the old towns and surrounding mountains. I’m sorry to miss Sasquan, the 73rd annual WorldCon being held in Spokane, Washington this weekend. Sky Warrior Publishing, publisher of my Clockwork Legion Steampunk books is there. If you’re at Sasquan, be sure to visit them and support them by buying their books. They have a terrific selection. Also, I have friends in the running for the Hugo Award, which will be presented at Sasquan tonight. I wish them luck and I wish I was there to support them! I know it’s been a turbulent year for the Hugos, but I hope tonight’s festivities hold nothing but fun for those involved. Although I’m genuinely sorry to miss WorldCon this year, I find myself thinking of one of my favorite moments from the San Antonio World Con two years ago. I was staying at a motel some distance from the convention, both for budget reasons and so I could have a quiet retreat from the convention. One night, I stopped at a Subway sandwich shop on the way to the motel. I was the only one there, along with the clerk. It turns out he was a science fiction fan, but couldn’t afford to go to WorldCon. We spent several minutes chatting. I told him about highlights of the day. He asked me what I wrote and he ended up buying one of my books. The episode reminds me that not all fans are at WorldCon and even those who don’t have to travel far can’t go for various reasons. 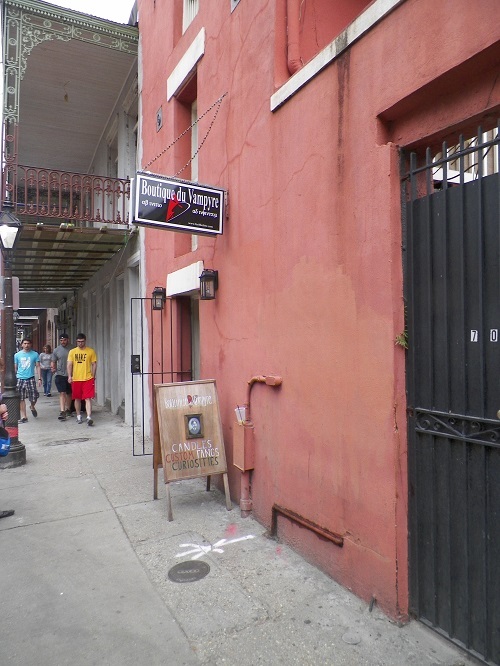 Today, I’m grateful to have been invited to sign my vampire novels at Boutique du Vampyre in New Orleans, where I am this weekend on family business. I’ll be at the Boutique from 3 to 6pm. Be sure to drop by and check out my books and the great selection of vampire goodies. I’m delighted for the chance to make friends and meet fans in New Orleans this weekend. 4pm – Main Room – Whither Ghost? Dancing with the Definitely Dead. Zombies are hot (which must startle them), but let’s not abandon ectoplasm. What roles do true ghosts play in the metaphoric dance of SF/F? What archetypes do they carry? Or are they just devices, good for frisson? How do ghosts in a story affect time and space? The forms ghosts take vary from culture; what are some wonderful ones we may be unfamiliar with? On the panel with me are Mary Robinette Kowall, Betsy James, Darynda Jones, and Sarena Ulibarri. 9:30pm – Main Room – Who Can it Be Now? Characters With Flaws. Is a flawed character, hero or villain, necessary in today’s fiction? Are the days of the white and black hats over, or can today’s readers tolerate a purely good or evil character without inner or outer flaws of morality, ethics, and motivations? Were there ever such characters at all? Conversely, how much anti-hero and sympathetic villain nature can be tolerated by readers before they are turned off? Which flawed characters work best? On the panel with me are Ben Bova, S.M. Stirling, Caroline Spector, and Walter Jon Williams. 10am – Main Room – Red or Green. N.M. as a Mars Analog. Does New Mexico share common features with Mars? Does the Red Planet have special appeal to NM scientists, readers, and writers? How are the two similar? Is NM a great training ground for a manned Mars mission? NM is lucky enough to have Larry Crumpler on the Mars Rover team, and Zachary Gallegos as one of the 100 finalists for the proposed Mars One Mission. What other NM scientists are doing Mars research? What does the appeal of the New York Times bestseller The Martian by Andy Weir mean for present and future Mars interest and projects? On the panel with me are Larry Crumpler, Zachary Gallegos, Loretta Hall, Christine MacKenzie, and Catherine S. Plesko. 10am – Main Room – It’s Alive: Scientists in Science Fiction. In Hollywood, everyone “knows” that scientists are typically treated as supervillains or antisocial nerds. But more and more, it appears that scientist characters are playing the hero. Have scientists truly escaped the old stereotypes? If so, what’s with the change of heart? What caused the stereotypes in the first place? The Atomic Age or maybe “messing around in God’s Domain?” I’ll be moderating this panel that also includes Daniel Abraham, Josh Gentry, Jeffe Kenedy, Catherine S. Plesko, and M.T. Reiten. In addition to these events, I’ll be helping out at the Bubonicon Author’s Tea, which is a special event where the authors of Bubonicon say “thank you” to the fans by presenting them with a fun, event. As of this writing, I don’t know which sessions I’ll be helping with, but seating is limited and it’s worth coming to any of them. Today marks the fiftieth anniversary of the British television series Doctor Who. I’ve been a fan for about thirty-two of those years. I actually discovered the series through Starlog Magazine. There was an article about how the actor who was playing the Doctor was changing from Tom Baker to Peter Davison. I was intrigued because the two actors didn’t look anything alike and I wondered how they could possibly do that. Unfortunately, growing up in Southern California, no PBS station at the time actually carried the series, so I had to wait a few months until I went to my uncle’s house in Florida before I would finally get to make my first journey with the Doctor. The episode was “Robot’s of Death” starring Tom Baker. 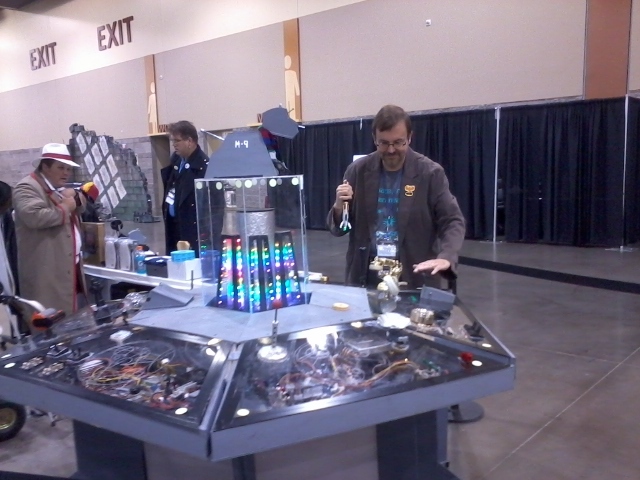 David working on the Tardis console. The Doctor looks on with concern! Eventually, after I returned home, the Los Angeles PBS station finally kicked off a run of Doctor Who starting with the 20th anniversary episode, “The Five Doctors.” From that point on, I’ve been able to watch, more or less regularly, when the show has been produced, until the present day. Doctor Who has inspired me over the years. It’s the story of an alien—a Time Lord—who wanders time and space in a machine called the TARDIS helping where he can, often with the assistance of a human companion. He has lived for hundreds of years and when he grows too old or, as more often happens, becomes injured beyond healing, he regenerates into a new body. Ramon and Fatemeh from Owl Dance have certainly taken some inspiration from the Doctor in terms of their desire to help people where they go. The Scarlet Order vampires have had to deal with questions of longevity and losing those they care about to time, just as the Doctor has. 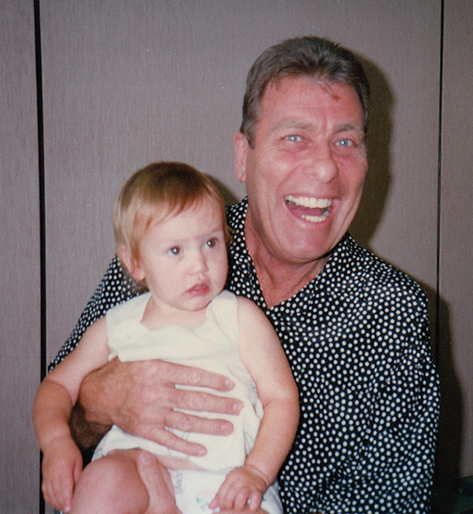 1996: My daughter Myranda meets John Levene—Sergeant Benton on Doctor Who. Not only has Doctor Who inspired elements of my writing, the show has crept into my personal life at times, too. When my wife and I were trying to decide what to name our second daughter, we were watching one of the early episodes. As the credits scrolled, we saw the name of the show’s first producer, Verity Lambert. We both looked at each other and decided to name our daughter Verity. Over Labor Day weekend, I was honored to be asked to be on the “Doctor Who: Celebrating 50 Years” panel with such folks as Alastair Reynolds, who recently wrote a Doctor Who novel featuring the third doctor, and Lynne M. Thomas, one of hosts of the Verity Podcast. One of the things I was able to contribute to the panel was an appreciation of the fact that there is much more to Doctor Who than just the television series. There have been two movies starring Peter Cushing and an ongoing comic series in Doctor Who Magazine. There are novels and there’s an ongoing audio series from Big Finish Productions featuring many of the past Doctors. They even started an animated web series when it looked like the show was not coming back to television. The first and only episode is available for free at the BBC’s Doctor Who Website. With all this going on, newcomers may wonder how anyone keeps all these Doctor Who stories straight. In fact, Doctor Who is rife with contradictions. Not only are there story contradictions that have been dismissed with a wave of the hand and a dismissive declaration of “wibbly wobbly timey wimey” but thematic contradictions. Doctor Who is at once serious and silly, excellent drama and pure cheese, wonderful storytelling and episodes that make you groan. One of the joys of Doctor Who is that it is not merely rife with contradictions, it revels in them, has fun with them and plays with them. Watching how writers have juggled that over the years has been one of the true delights of the show. I was once asked, if given the opportunity, would I write for Doctor Who? In fact, I once wrote a story based on the eighth Doctor visiting the 1963 World’s Fair in Seattle. So yes, if the Doctor ever came calling and asked if I would go traveling, you bet, I’d be there! As this morning dawns, I’m finishing my first night back at Kitt Peak National Observatory after taking some time off for Bubonicon in Albuquerque and WorldCon in San Antonio. Both conventions were great. Between the two, I got to catch up with many friends and colleagues, and made many new acquaintances. 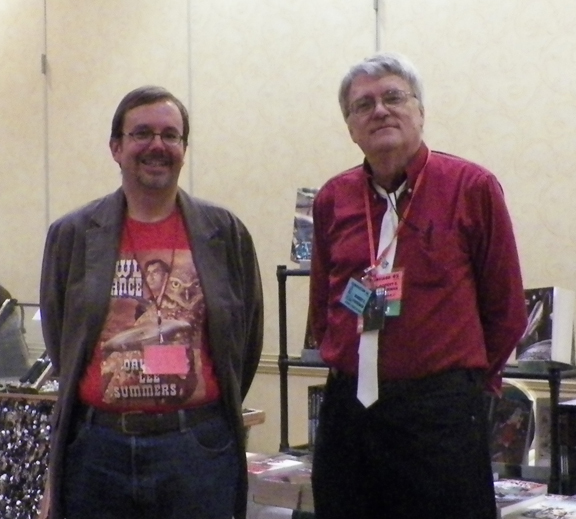 In the photo, you see me with Bob Vardeman, creator of the Empires of Steam and Rust series. He’s encouraging me to write a follow-up to my Revolution of Air and Rust, which I’d very much enjoy. Just as this convention season kicked off, I received the first round of edits for my latest wild west steampunk novel, Lightning Wolves. My editor is Phyllis Irene Radford, who edited the Gears and Levers anthologies for Sky Warrior Publishing. I’ve been working my way through a new draft based on her notes. Another thing that happened just as the convention season kicked off was that one of my publishers approached me with a proposal for a new book series. It’s too early to say much about this, but I did work up a detailed outline for the first book while I was in San Antonio and I’ve discussed it with my publisher, who seems enthusiastic. What I can tell you is that if this series goes forward, and it seems likely, is that it will include terror, ghosts, southwestern lore, and even some astronomy. Stay tuned! In addition to writing, I’m also finishing up Tales of the Talisman volume 9, issue 1. The last illustration was turned in tonight and I’m in the throes of proofreading. The issue will be going to press by the week of September 22. Once that’s printing, I’ll be moving right into issues 2 and 3. Of course, while I was in San Antonio, I had to visit the Alamo. 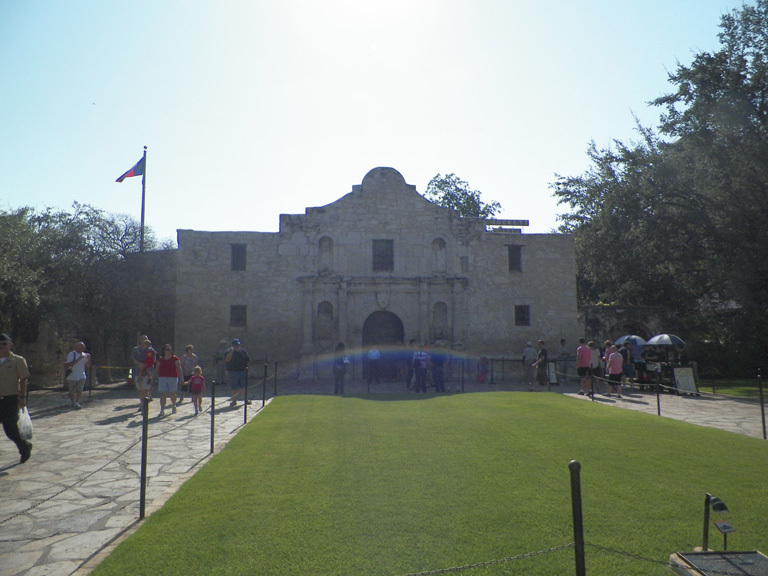 I’m distantly related to Davy Crockett, and it was moving to see where he made his last stand. With all that’s going on in my life, it’s hard not to feel a little like a soldier in the trenches. However, I feel like I’m a long way from any last stands. This seems like a good juncture to say thanks to all those readers who have joined me on the ride so far. I hope you’re looking forward to what comes next as much as I am! A week ago at WorldCon, I moderated a panel entitled “The Poet as Activist: On Seeing and Saving the Natural World.” This proved to be an interesting topic and we discussed many of the ways a poet or a writer can work in hospitals, schools, or with nature centers to help as educators or to bring awareness of issues to the public. My fellow panelist, Rie Sheridan Rose, assembled an excellent list of resources for people interested in this topic and I wanted to share them here. http://www.flycatcherjournal.org/submission-guidelines.php — strives to explore what it means—or what it might mean—to be native to this earth and its particular places. http://catamaranliteraryreader.com/contact/ — especially interested in include diversity, environmentalism, artistic spirit, personal freedom, and innovation. http://andromeda.rutgers.edu/~lcrew/pbonline.html — Poetry Markets willing to take electronic submissions. Hope you find this guide useful. If there was something we mentioned on the panel and I neglected to mention it here, feel free to bring it to my attention in comments and I’ll try to add it to the list above. As always, I’m happy to answer questions about the topic. Next week, I’ll be attending LoneStarCon 3, the World Science Fiction Convention, in San Antonio, Texas. I’m excited partly because it’s WorldCon and many of my favorite writers will be there, but I’ve also wanted to visit San Antonio for a while. A few years ago, I discovered that I’m a distant nephew of Davy Crockett, so I’ll definitely pay a visit to the Alamo while I’m there. The convention is being held from August 29 through September 2 at the Henry B. Gonzalez Convention Center in downtown San Antonio. You can get all the details about the convention at lonestarcon3.org. 10am-11am – The Poet as Activist: On Seeing and Saving the Natural World. In the 19th century, inspired by Emerson’s essay, Nature, Henry David Thoreau initiated a tradition of the nature writer as observer-artist. Today, that tradition continues, but amid a natural world that has been nearly devastated by our own species. Explore the evolving role of the nature writer as artist and activist. Are seeing the world and saving the world part of the same work? On the panel with me is Rie Sheridan Rose. 11am-noon – Presentation of the Science Fiction Poetry Association’s Rhysling & Dwarf Stars Awards. Nominees for each year’s Rhysling Awards are selected by the membership of the Science Fiction Poetry Association. Each member is allowed to nominate one work in each of two categories: “Best Long Poem” (50+ lines; for prose poems, 500+ words) and “Best Short Poem” (0-49 lines; for prose poems, 0-499 words). All nominated works must have been published during the preceding calendar year of the awards year. The Dwarf Stars Award is for best speculative poem of 1-10 lines published in the previous year. 1pm-2pm – The History of Science and the Experience of Science Fiction. Science fiction, janus-like, gives us a perspective on the future by examining how science and technology have developed. Speculating on the future in our fiction can also give us insight on how science developed or went into blind alleys. How does the history of science inform the way we read and write science fiction? Or is it vice versa? On the panel with me are: Miguel Angel Fernandez, Donald M. Hassler, Kim Stanley Robinson, and Kathleen Goonan. 4pm-5pm – Kaffeeklatsch. Come join me for a cup of coffee and the chance to ask me what you will! 10am-11am. Speculative Poetry Workshop. Come and learn about speculative poetry and create your own poem. I’ll be hosting the workshop along with Alan Stewart and Jaime Lee Moyer. Looking forward to seeing some old friends and making many new friends in San Antonio next week. If you’ll be there, drop me a note or a comment so I can be on the lookout for you.